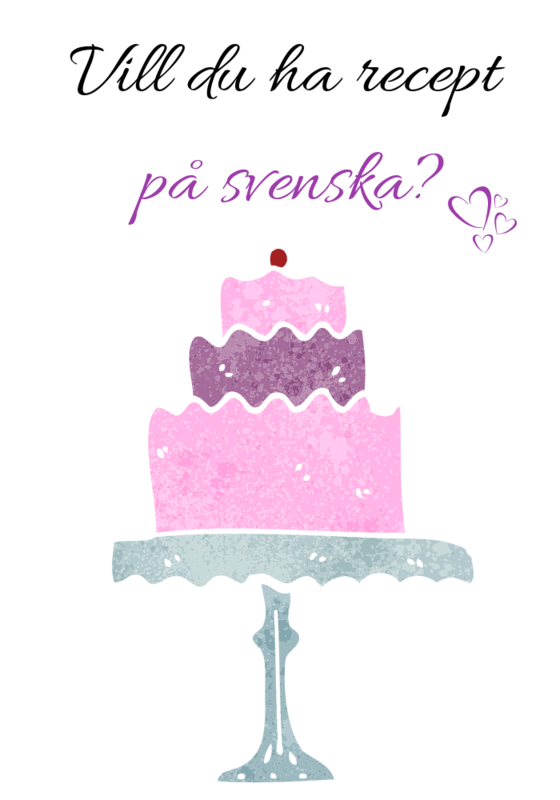 Receptet finns även på svenska på Mitt Engelska Kök. One thing I miss most about not living in the UK is sausage rolls. If you are a Brit, these little flaky pastry loves need no introduction. However, outside of the UK (Australia and New Zealand aside), it appears that sausage rolls are one of Britain’s best kept secrets. 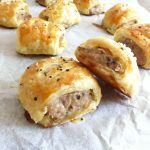 I was amused to read recently that Americans have been slow to catch on to the concept of sausage rolls (here’s a very light-hearted article which highlights why). To my American readers: you are missing out, big style. You need to fix that and fix it fast. 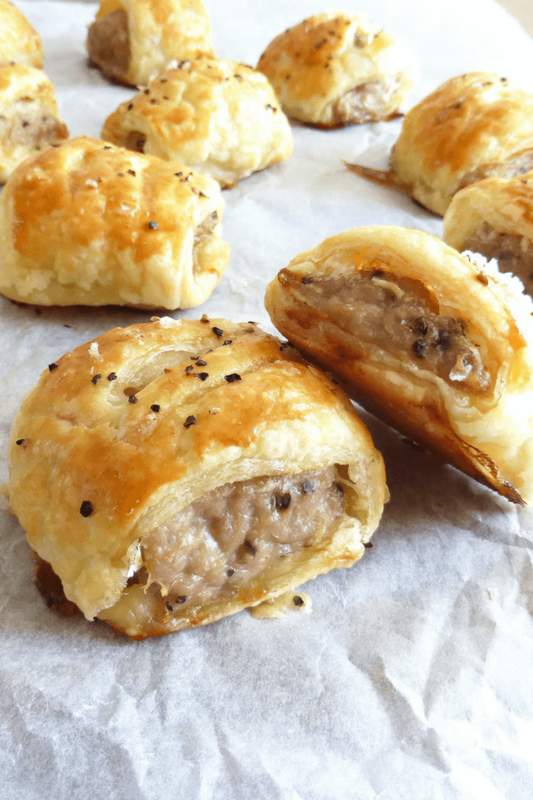 You need sausage rolls in your life more than you need anything else. Promise you. 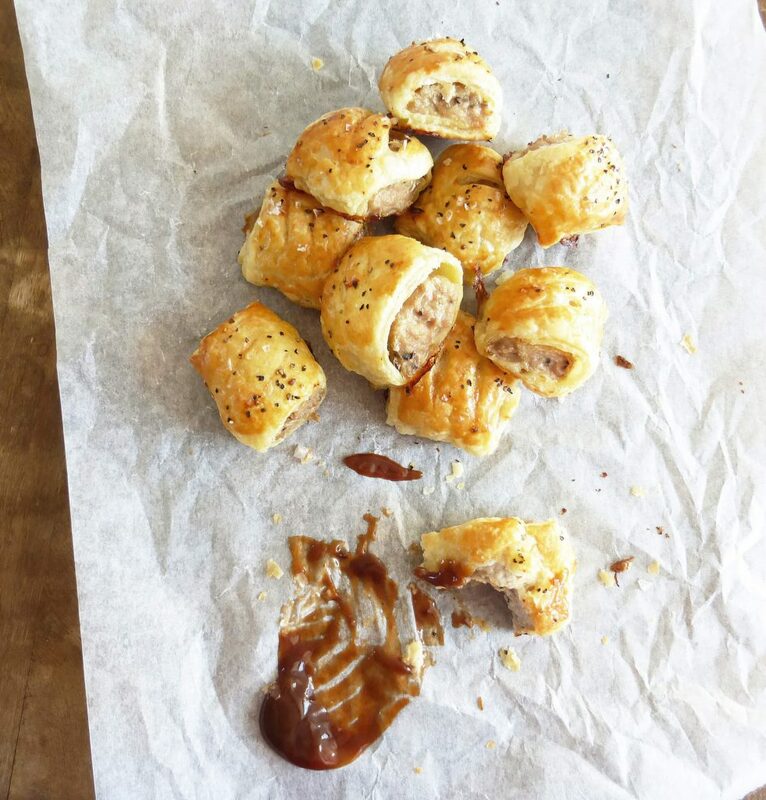 As the article above states, sausage rolls are not pigs in blankets. Not even close. For a start, they are made with sausage meat (ground meat/mince) and not whole sausages. 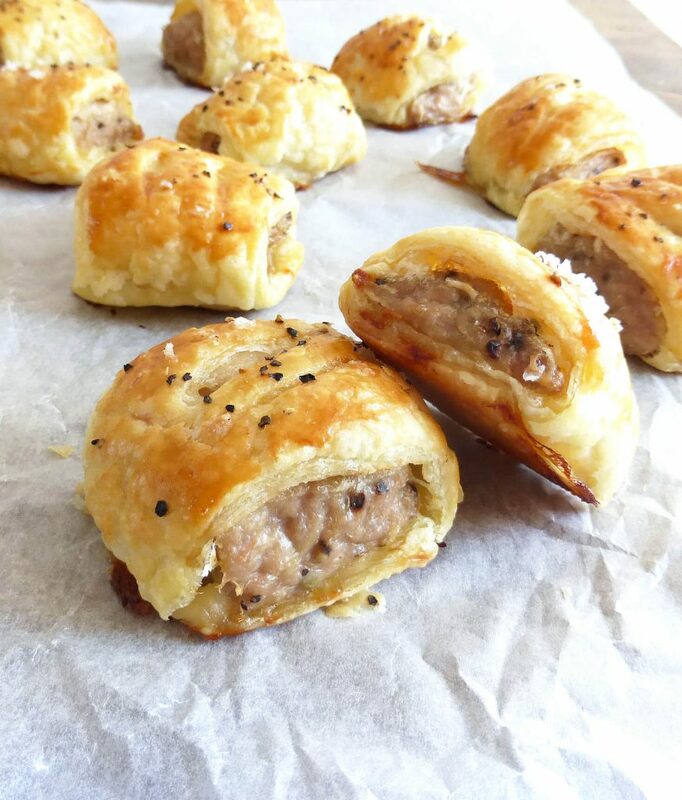 Sausage rolls are encased in pastry; pigs in blankets in more of a bread. They are absolutely apples and oranges. Although sausage rolls are traditionally made with pork, I only had chicken mince in the house and decided to use that. Because chicken mince can be a little wetter than regular ground meat, you don’t need to add any breadcrumbs. All I did was throw in a little seasoning and the sausage roll filling was ready to go. The pastry is store bought. Naturally. 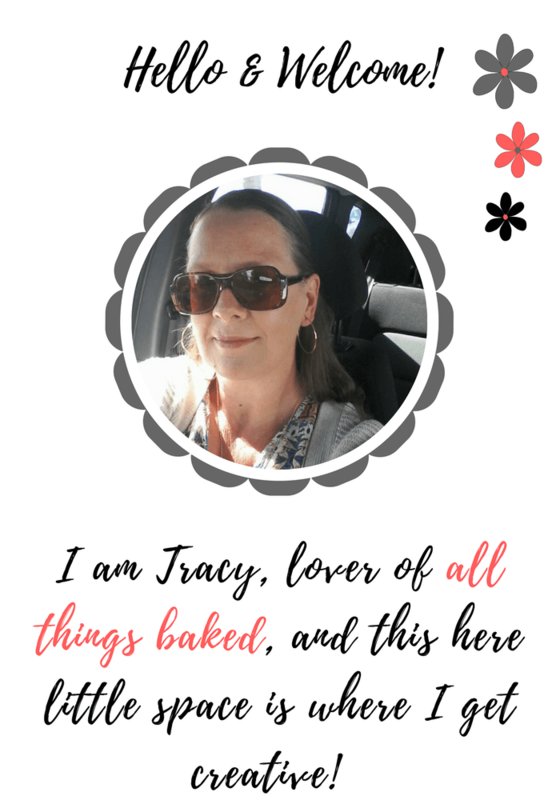 You guys know how much I love my food to be homemade, from scratch, in its entirety, but if you think I am going to stand and make puff pastry when it is 30ºC out there (and us northern Europeans are without A/C don’t forget), you can think again. Using ready made pastry and chicken mince mean that these are ready in minutes. 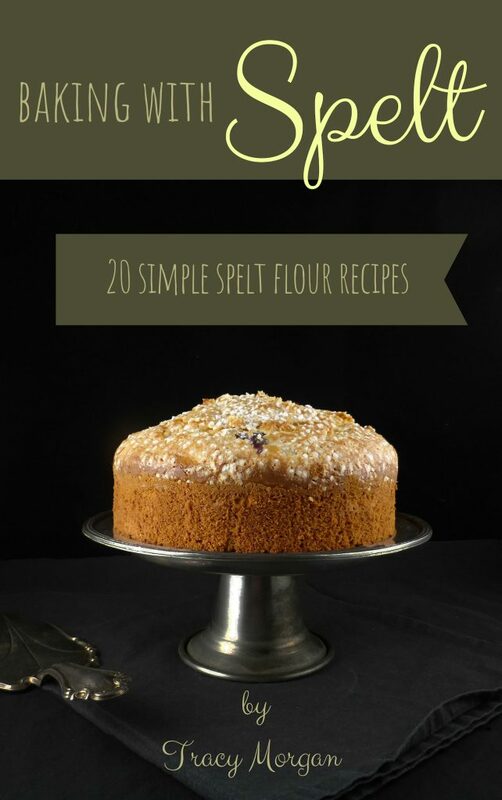 Serve with the obligatory HP sauce (or Ketchup, if you must) and enjoy. They are great on picnics, for a snack, or a light lunch. Pre-heat the oven to 175ºC (350ºF). Place the chicken mince in a bowl and add the salt, pepper, oregano and garlic pepper. Stir to combine everything. Roll out the pastry and cut into four rectangles. Take one rectangle, with the long side facing you and place a quarter of the mince right along the whole length. Have it as close to the edge as you can or you won’t be able to roll it properly. Roll up the pastry ending up with the seam underneath. Place on a large oven tray lined with baking paper and cut into four bits. Repeat with the others. Beat an egg and then wash all over the rolls. Sprinkle with sea salt and pepper then bake for around 30 minutes until golden, and the pastry is no longer soggy. Remove from the oven and either eat warm or when cold. Enjoy!